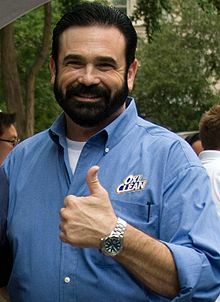 William Darrell "Billy" Mays, Jr. (July 20, 1958 – June 28, 2009) was an American television direct-response advertisement salesperson most well known for promoting OxiClean, Orange Glo, and other cleaning, home-based, and maintenance products. His distinctive beard and loud sales pitches made him a recognized television presence in the United States and Canada. He starred in his own TV show called Pitchmen with his friend and co-worker Anthony Sullivan. The show was on for one season before his sudden death. Mays died on June 28, 2009 from complications of heart disease. He was 50. ↑ 1.0 1.1 "TV pitchman Billy Mays found dead in Tampa home". Tampa Bay Online. June 28, 2009. Archived from the original on 2009-06-30. Retrieved 2009-06-28. ↑ 2.0 2.1 "Report: 'Infomercial King' Billy Mays Found Dead in Home". FoxNews.com. 2009-06-28. Retrieved 2009-06-28. ↑ "Autopsy: Cocaine contributed to Billy Mays' death". usa Today.com. 2009-08-07. Retrieved 2011-04-18. This page was last changed on 24 March 2019, at 04:01.